Hi everyone! 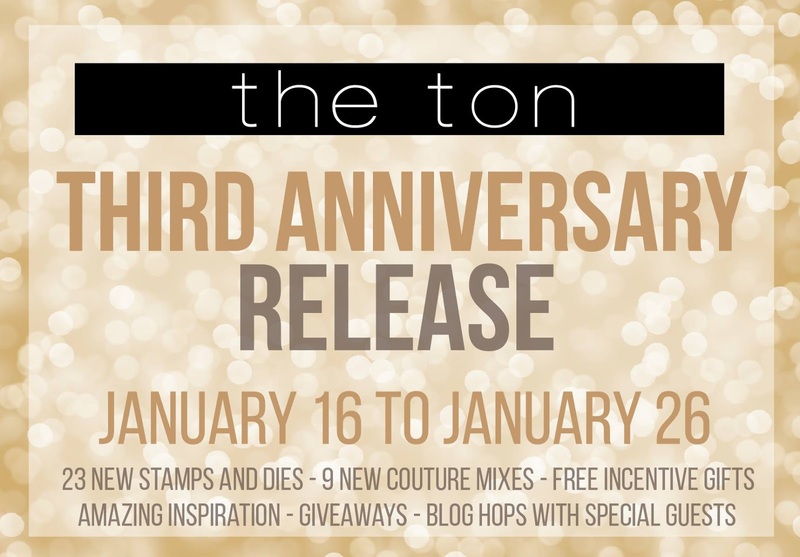 Welcome to The Ton's 3rd Anniversary week long celebration! For this release, Effie has released 23 new stamp designs, coordinating dies and 9 new couture mixes! And, I for one think this is pretty amazing release. I can't pick just 1 favorite! I have several. Hah! This time, we are doing the hop a bit different. Instead of just a day of hop, we have several days of blog hop with many amazing guest designer line up. Starting today all the way to January 26, join us for a fun blog hop filled with fun projects. I made 3 cards for today. Let's start with the pretty Coming Up Daisies set. This was my first time playing with Ken Oliver's Color Burst. On this card, you can see the intensity of the color compare to the card that I made yesterday (which I diluted a lot). As someone that used to neat line, I have to learn to just let it go, let the color spread and go where they want. I start by stamping and heat embossing the flowers. Then I wet the cardstock and carefully sprinkle the various color powder and move the carstock around to let the color move. For embellishment I added some mix size dew drop. Next is my favorite card that I made for this release using The Peony Notes Bundles combined with Seriously Amazing Sentiments and the previously release Basic Labels. This is such a neat bundle! And, I love, love the large bold sentiment. Last but not least, is a pretty clean and simple card using Large Floral Daisy set. I will be playing more with this set. I got the matching dies this week & haven't got a chance to play with it, but I am excited to create more cards with this pretty set. There are two new gifts with purchases that you can obtain with this new release. *This promotion does not apply to prior purchases. The threshold amount is calculated before taxes and shipping. This promotion will continue until February 1 at 11:59pm EST or until supplies last. Limit one incentive package per order. No coupon code needed. All incentive products will be added to qualified orders automatically (but will not be shown in your cart at checkout). There must be at least one new release stamp in your order to qualify for these GWPs. For orders previously placed containing our new Smooched or XOXO Mini sets: These previous qualifying orders can be added to your new order to qualify for incentive products. Please include original order number in the notes of your second order. Here's the complete list for today's hop. I hope you enjoy your visit here & enjoy the hop. 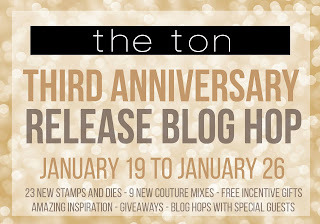 Hi peeps and welcome to day 2 of The Ton's 3rd Anniversary Release. To celebrae, Effie has released 23 new stamp designs, coordinating dies and 9 new couture mixes! For today, I want to highlight the free sets that you can obtain with purchase. First up is a card I made using Peony Notes Bundles. This bundle feature an array of stamps that enable you to stamp layered floral clusters effortlessly because each layer of the florals are combined into a single easy to stamp cluster. Peony Notes A + B are two 6×8 stamp sets that feature the actual floral clusters and foliage stamps. Peony Notes C is also a 6×8 set which features a large solid background stamp allowing you to stamp the negative areas around the floral cluster. For this card I am playing with Ken Oliver's Color Burst. This is only the second time I am using the Color Burst and am still struggling at sprinkling the color at very small amount. Trust me, you only need very little as the colors are pretty intense. I had to add lots of water and lots of dabbing to soften the color (tomorrow, I'll have a card that show the more intense color). I finish the card with some sequins mix from the new Lilac Blossoms couture mix. There are two new gifts with purchases that you can obtain with this new release. *This promotion does not apply to prior purchases. The threshold amount is calculated before taxes and shipping. This promotion will continue until February 1 at 11:59pm EST or until supplies last. Limit one incentive package per order. No coupon code needed. All incentive products will be added to qualified orders automatically (but will not be shown in your cart at checkout). There must be at least one new release stamp in your order to qualify for these GWPs. Today we're introducing Haute Gala Dress, Painted Peonies, Timeless Peonies Print, Delicate Polka Dots, The Most Interesting Cardmaker 2.0, Peony Bouquet and 3 more couture mix called Pink Cosmo Twist, Sakura Petals and Misty Mint. For my 1st card I used the beautiful Peony Bouquet set. Colored it with Copic markers and then add sentiment from The Most Interesting Cardmaker 2.0. This set is filled with some really fun sentiments! My 2nd card is using one of my favorite sets from this release, the Timeless Peonies Print and the Seriously Amazing Sentiments set. I first stamped the layered flower background and then stamped and heat embossed the sentiment with The Ton Rose Gold embossing powder. Our new Peony Notes sets feature an array of stamps that enable you to stamp layered floral clusters effortlessly because each layer of the florals are combined into a single easy to stamp cluster. Peony Notes A + B are two 6×8 stamp sets that feature the actual floral clusters and foliage stamps. Peony Notes C is also a 6×8 set which features a large solid background stamp allowing you to stamp the negative areas around the floral cluster. 1. 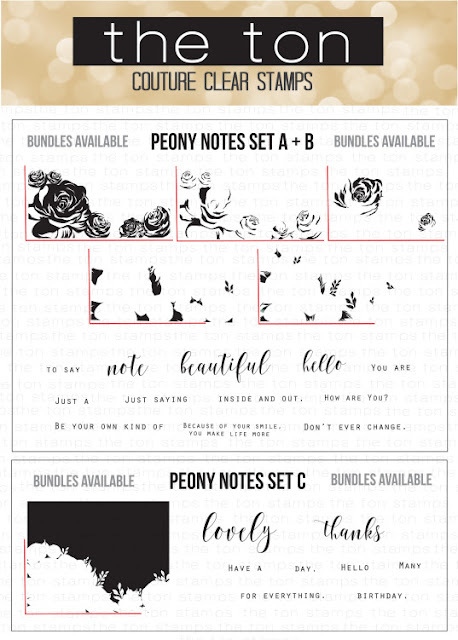 Peony Notes Bundle A+B+C ($55): Purchase the complete bundle for $55 or receive this set for free with a new release order over $250* (Restrictions apply, see details above). 2. Peony Notes Bundle A+B ($42): These two sets allow you to stamp the florals and foliage clusters. 3. Peony Notes C ($21): This lone 6×8 set is available for purchase separately. Hi everyone and welcome to The Ton's 3rd Anniversary Release. For this anniversary celebration, Effie has released 23 new stamp designs, coordinating dies and 9 new couture mixes! Today, we are introducing Fresh Cut Daisies (Layered + Outlines), Large Florals: Daisy, Seriously Amazing, Coming Up Daisies, Buildable Woodgrain, Riotous Wildflowers, Winter Cardinal, Bold General Word Greeting Dies and Bold Amazing Word Greeting Dies (all links will go live on 1/19/2018). And introducing 3 new couture mix. My 1st card is featuring the Winter Cardinal. Did you know that Cardinal comes in many colors? I learned this while searching for color ideas that there are many variety of Cardinal. I love learning something new from just searching for inspiration. :) For the sentiment I used the thank you from Occasion Confetti set. For my 2nd card, I played with Riotous Wildflowers set. I have this set of Aladine Izink Pigment inks that just been sitting on my shelves and I decided to give it a try. I used the yellow & the red and the colors are pretty intense. I diluted the red quite a bit. Didn't do that with the yellow. I find them to be a bit harder to blend, but then again this is my 1st time trying them, so I probably just need more practice. For the softer yellow, I used Zig Clean Brush. 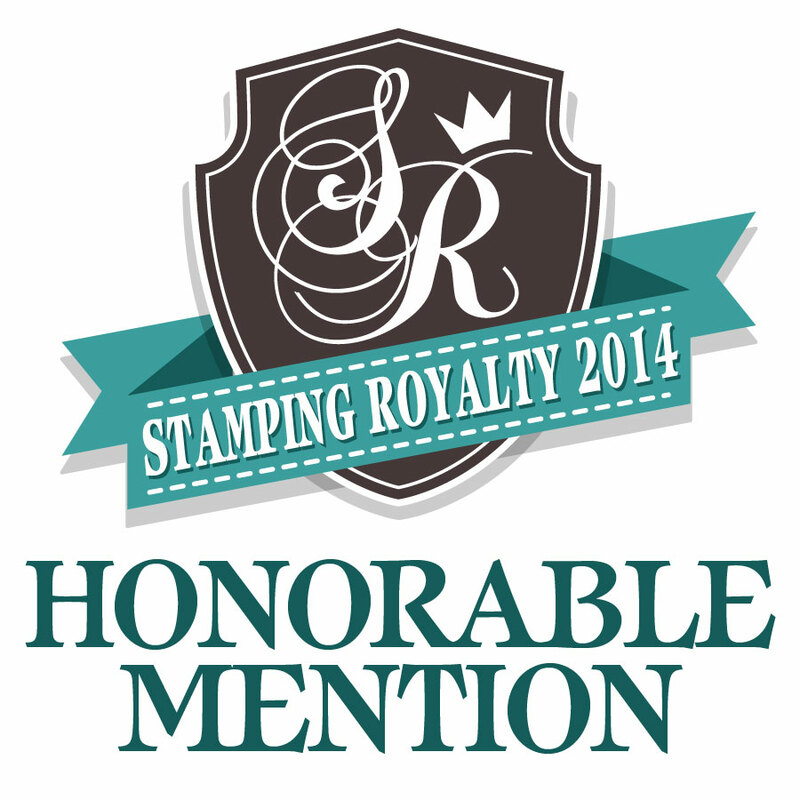 For each Release Day (1 through 4), The Ton is giving away a stamp set of choice from the new release! So there are four stamps up for grabs! To qualify, you must leave a comment on The Ton's Daily Release posts. 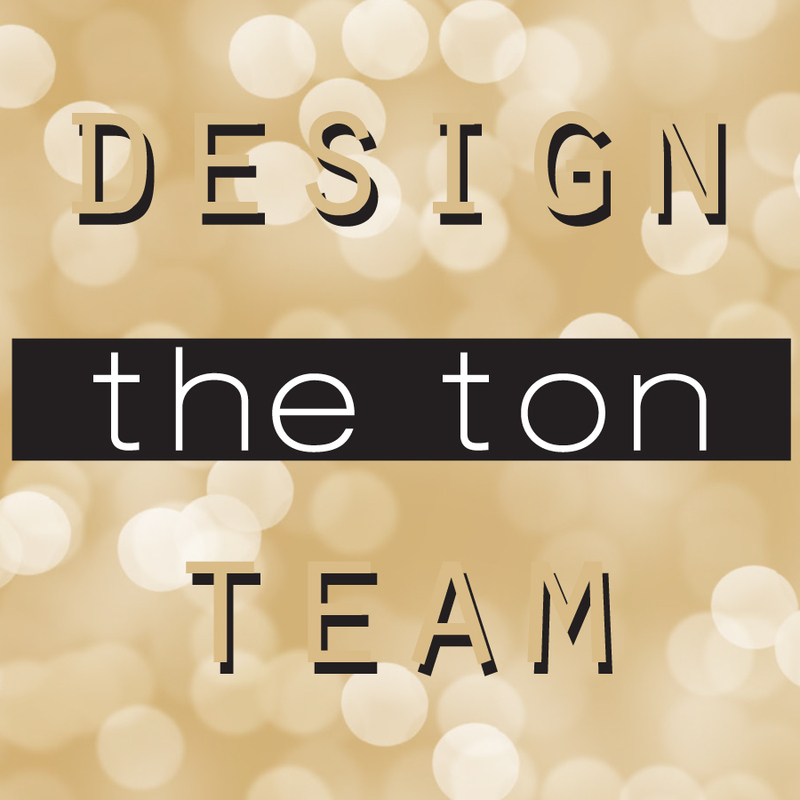 Leave a comment on each Design Team member's blogs to increase your chances of winning. The comment period will close on Monday, January 22 at 11:59pm. Winners will be announced thereafter on The Ton’s blog. Hope you enjoy today's sneak peek & come back tomorrow for more beauties! Hi peeps!! Sorry, I am a day behind in announcing the winners from Season's Giving blog hop. So, without further delay, here are my winners. Thank you for joining us on the hop and congratulation to these 3 lovely ladies. Ladies, please email me at wirianta@hotmail.com your mailing address. Congrats!! Hi peeps.How's it going? I am bundling up as the cold weather hitting Houston area. Although, compare to those that get snowed in, I really have nothing to complain about. I am just whiny when it's cold. LOL. 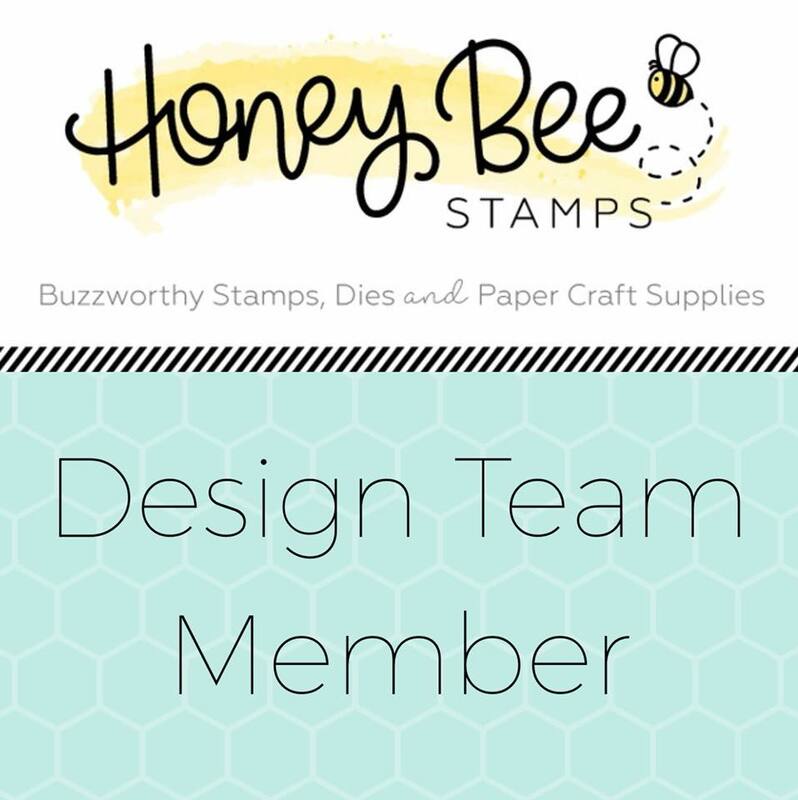 Well, I want to pop in real quick to share this hello card I made for Honey Bee Stamps. Fun fact, when I first get started in stamping, I found flower stamps to be intimidating. I tend to to stick to cute critters stamps. And, now, I couldn't imagine not working with flower sets. Flower sets tend to catch my eyes right away (I still love cute critters as well). This Honey Bee Hello Gorgeous set is one of my favorite from their collection. This flower sure makes me wish for spring weather to be here. Well, that's all from me today. May your day starts off wonderfully. Happy New Year everyone! Welcome to 2018. Let starts the year with lots of cheering that we made it through 2017 and may 2018 be a good year for all of us that's filled with many good things and blessings. And, how about a new challenge to get your creativity going? 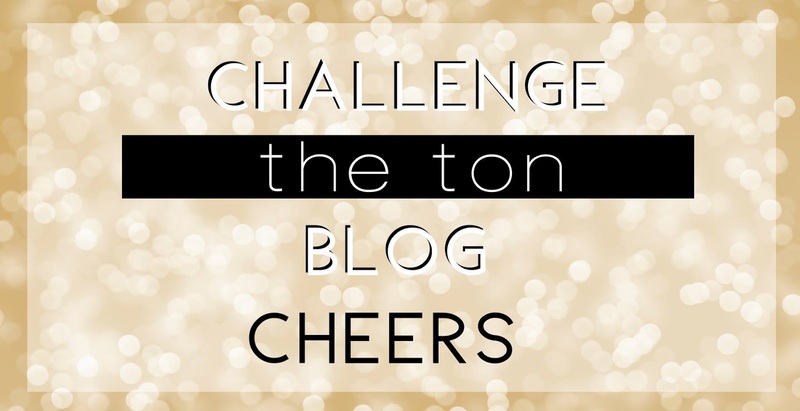 For this month, The Ton challenge theme is cheers! I made this card using The Ton Brushed Cheers & Vogue Skies set. I start by stamping and heat emboss the sentiment. Then using Misti, I stamp the skyline is rainbow colors and finish by adding some sequins from Ice Blue Couture Mix. Super easy & fun challenge, right? I hope you will join us and play along. you can find all the challenge detail and enter your card: HERE.